Laura received her Doctorate of Physical Therapy from Virginia Commonwealth University in 2015. She then continued her education with completing an orthopedic residency through the Virginia Orthopedic Manual Physical Therapy Institute in 2016 and has obtained her Board Certification in Orthopaedic Specialty (OCS). She is Level 1 Titleist Performance Institute (TPI) certified and is a Credentialed Clinical Instructor through APTA. 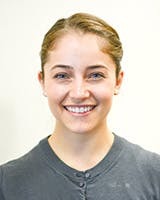 Laura is a staff physical therapist at Progress Physical Therapy.